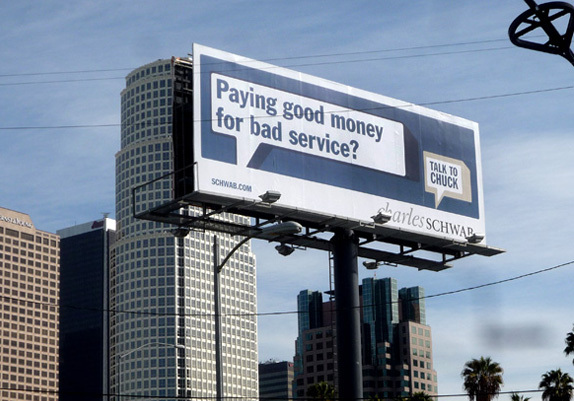 This billboard alongside the Harbor Freeway in downtown L.A. was put up in 2008 without permits and inspections. Are those billboards you pass every day on your way to work legally permitted? Do they comply with all the pertinent sign regulations regarding height, size, and number of faces? The city promised to answer those questions a decade ago, with the implementation of the Off-Site Sign Periodic Inspection Program, commonly referred to in City Hall as OSSPIP. Inspectors would fan out through the city, locate every single billboard, and conduct an inspection to make sure it was legal. The results of this inventory and inspection would then be posted on the city’s website, so that members of the public could look up any billboard and find out whether it was permitted or complied with the conditions of its permit. Almost before the ink dried on the OSSPIP ordinance, the big billboard companies sued the city, claiming the program infringed upon their constitutional rights. Two years later, that claim was rejected by the 9th Circuit Court of Appeals, which found that the city was acting completely within its rights. But the court also allowed the billboard companies to pursue a claim that the fee levied on billboards to pay the program costs was excessive and should be reduced. That fee–$368 per off-site sign for a three-year period–was still the subject of litigation in 2006, when the City Council acted without any warning or public discussion to approve a settlement of the lawsuit. That backroom deal reduced the fee to $186 and set the start date for the inspection program at March 30, 2007, although this fact went mostly unnoticed amidst the settlement’s more notorious provisions, such as allowing Clear Channel and CBS Outdoor to convert 840 of their conventional billboards to digital. In any event, the public had a right to expect the inventory and inspections to be complete by the end of the three years, or sometime in the first half of 2010. At that time, anyone would be able go to the city’s website, click on a billboard address, and get all the relevant information about the sign. But in fact, March 30, 2007 came and went without any sign of OSSPIP being implemented. Citizens in council district 11, on L.A.’s far westside, finally got tired of waiting and organized their own inventory. On a Saturday morning in October, 2008, more than 30 volunteers, including staff members from Councilman Bill Rosendahl’s office, set out through the district, noting the addresses and other details of the billboards they came across. Shortly thereafter, citizens in Council districts 4 and 5 organized their own inventories, which could only show the number of billboards and their locations, not their legal status. The spectacle of citizens taking time out of their weekends to do a job the city was supposed to do obviously caught the attention of councilmembers and other officials, because an ordinance setting the amount of the inspection fee and enabling the inventory quickly appeared on the city council agenda and was unanimously approved. Better late than never, right? Well, that depends upon whether you expect the program to actually fulfill its promise, because to date there is no publicly accessible billboard database on the city’s website and no inkling of when there might be one. Despite the passage of more than three years since inspectors finally set out through city streets the public doesn’t know exactly how many billboards there are in the city (with the exception of the three aforementioned districts), where they are, and whether they are legal and in compliance with their permits. What’s the explanation? Shortly after the program got underway, Andrew Adelman, then general manager of the Department of Building and Safety, told a committee that because of the recession and slowdown in building construction he had been able to commit extra inspectors to the program, and expected it to be completed long before the end of the three years. In the past year, city officials familiar with OSSPIP have said informally that the work is done, and have even cited approximate numbers of billboards–a little more than 6,000 structures with a total of about 9,000 faces. According to those officials, about 5,000 of the structures inspected had permits, but a significant percentage may be violating some provision of city sign regulations– by being enlarged or raised, for example, or having a second face added without proper permits. Various persons, including the author of this article, have asked Building and Safety to release this information, or to specify a date by which it will be released. Those requests have been met with varying responses. One of the earliest was that the City Attorney had advised against releasing any billboard data until certain ongoing legal cases were resolved, particularly the Summit Media v. City of Los Angeles case that challenged the 2006 lawsuit settlement that allowed the digital billboard conversions. Because that lawsuit settlement also legalized all pre-1986 billboards whether or not they were permitted or complied with their permits, Building and Safety obviously couldn’t determine their legal status with certainty while the settlement was still being litigated. (The settlement was thrown out by a Superior Court judge in late 2009, but the decision was appealed to the California Appeals Court and a ruling is still pending.) However, at least one of the persons who had requested the OSSPIP results was told by a City Attorney’s representative familiar with billboard litigation that there was no reason the Summit Media case would bar Building and Safety from releasing the information. A formal request for the information, under provisions of the California Public Records Act, was made by Elisabeth Sedano, a Ph.D candidate at USC who developed a website with an interactive map intended to eventually show the location and status of every billboard in the city. Building and Safety responded that it would provide the address, size, and height of billboards for a fee of $624, but said nothing about information regarding what companies owned the signs or if the billboards were permitted and in compliance with those permits. After Sedano objected, Building and Safety said that upon further advice from the City Attorney, only the addresses of sign structures could be provided, at a reduced cost of $312. Those details, of course, would not reveal whether a billboard was illegally altered, or put up without any permit at all, which was one of the primary purposes of the OSSPIP. The latest in a series of explanations for the absence of publicly-posted OSSPIP results is that the money from the fee levied on billboards ran out before a publicly-accessible database could be developed. Whether or not this explanation contains more veracity than the others is impossible to tell, but what is obvious is that the public is being denied facts that it was promised long ago. This blackout, so to speak, is particularly glaring given the fact that a new citywide sign ordinance now pending before the City Council could pave the way for sign districts allowing hundreds of thousands of square feet of new off-site signage in a wide area of the city, from downtown to Koreatown to the San Fernando Valley. How many billboards are already in those areas? What is their legal status? What companies own them? Billboard companies are also known to be lobbying city officials in an effort to allow existing digital billboards to remain and new ones to be put up in exchange for removing a certain number of conventional billboards. Do these companies maintain billboards that have no permits or violate the terms of their permits? We do know where some illegal billboards are. Several, including the one pictured above, are directly across the freeway from L.A. Live, where proposals for dozens of new signs on the L.A. Convention Center and elsewhere in the area are part of the city’s deal with AEG to allow construction of a new NFL stadium. But that’s because the City Attorney filed criminal charges against the sign owner. But where are the other 1,000 or so that supposedly don’t have permits? Could it be one of those in your neighborhood? Will you be able to find out anytime soon? Ten years and counting, those questions are still unanswered.